With just a week to go for the completion of 11 years of the formation of Uttarakhand, the issue of the identification of statehood agitators is yet to be resolved. Uttarakhand Sports Minister Khazan Das here today honoured ace shooter Vivek Kumar Singh, who had clinched two gold medals during the Asian Junior Shooting Championship held in Kuwait recently. Albha Oberoi, a pistol shooter from Dehradun, has won a silver medal in the Fourth Asian International Air Gun Championship held in Kuwait recently. Albha Oberoi from Dehradun (extreme left), who won a medal in the Fourth Asian International Air Gun Championship held in Kuwait recently. A bonanza of short films and documentaries being screened at the third film festival titled “Pratirodh ka Cinema” (Cinema of Resistance) at the Chalet Hall here have drawn great appreciation from those interested in serious cinema. The emergence of the new media whereby videos can be shot with the help of small portable cameras and uploaded on sites like youtube.com has emerged as a potent tool for the tribesmen of Orissa who are fighting against the forces bent on exploiting the natural resources in their areas of habitat and displacing them. “I congratulate the Chief Minister of Uttarakhand, Major-Gen BC Khanduri for proposing the Lokayukta Bill in the state Assembly and if it gets passed, then Dehradun would be the first state in the country to support the movement against corruption,” said Dr Kiran Bedi, a member of the Team Anna, who was here to address the students of St Joseph’s Academy today. Owing to a continuous shortage of LPG cylinders and annoyed at the functioning of the Mussoorie Gas Sewa, residents are demanding the opening of another gas agency. The 92nd birth anniversary of martyr Kesari Chand of the Azad Hind Fauz was celebrated in the city today. Union Minister of Science and Technology Vilasrao Deshmukh has called upon scientists to develop innovative technologies to make large quantities of petrol and diesel from one barrel of crude oil. Sports Stadium, Mathura, won by 80 runs against UP Cobras whereas Sher-e-Punjab scored a 56-run victory over its rival, Tamil Nadu, in the Uttarakhand Youth Twenty-20 Cricket Tournament matches held at Survey Stadium here today. Kendriya Vidyalaya-Hathibarkala (number one) got the better of Kendriya Vidyalaya-OFD 12-6 in the boys’ sub-junior category in the ongoing District-level Handball Tournament held at the Parade Ground here today. Cantt Blue beat Shivalik 3-2 in the ongoing Shaheed Jaideep Bhandari Memorial Football Tournament held at SGRR, Nehrugram, here today. Tushar (21st minute) and Rahul (44th and 50th) were stars in the win of Cantt Blue. The row over the alleged encroachment and illegal construction on government land by Pilot Baba around his ashram, Kaya Kalp Peeth, Saing Kumalti, near Uttarkashi, is far from over with the a district court passing a stay order on further construction yesterday. More than 12 schools will be participating in the regional athletics meet to be held from November 8 to 10 at the Survey ground here. Those who had played a pivotal role during the statehood agitation in the 80s and the 90s are feeling neglected by the state government’s policies on the identification of statehood agitators. Irked, more than 200 statehood activists, including women, today launched an agitation in front of the District Magistrate’s camp office in protest against various discrepancies in the identification process. Under the aegis of the Uttarakhand Rajya Andolankari Sangharsh Samiti, the agitators have threatened to intensify their stir if the state government failed to draft an amicable policy that covers the statehood agitators. Addressing the activists, central chief of the samiti Harsh Prakash Kala said even after over 10 years of the formation of Uttarakhand, the successive governments had failed to identify the statehood agitators. “More than 2,500 activists were arrested in Haridwar alone during the movement, but only those who had political background made it to the statehood agitators’ list,”said Kala. Founder of the samiti Hari Dutt Bahuguna also showed proofs of many such agitators who were actively involved in the agitation but were denied the statehood agitator status by the administration. He said they didn’t fight for a separate Uttarakhand keeping an eye on the benefits later but for the overall development of the region. A memorandum was also submitted to District Magistrate R Senthyl Pendiyan by samiti’s executive members, in which they threatened to intensify their stir if no concrete step is taken by the state government before Uttarakhand Foundation Day to be observed on November 9. 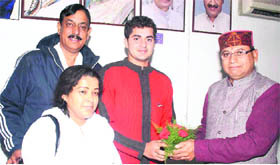 Uttarakhand Sports Minister Khazan Das honours Vivek Kumar Singh in Dehradun on Tuesday. The minister said it was a matter of honour for Uttarakhand that its sportsmen were excelling in abroad also. He said other budding sportsmen, especially shooters, must get inspiration from Vivek. Vivek Kumar Singh, a Roorkee resident, has been trained at Jaspal Rana Shooting Range, Paundha, in Dehradun. Narayan Singh Rana, chairman of the Uttarakhand Sports Promotion Council, lauded the performance of Vivek Kumar Singh. Albha has passed out from Summer Valley School, Dehradun and is taking training at the Doon Institute of Shooting and Sports, Dehradun, which is affiliated to the Uttarakhand Rifle Association. “Training under ace shooter Jaspal Rana helped me to hone my skills and become more focused,” she said. The festival is presenting various forms of cinema that are available to the world today. On one side there are feature films in the offing while on the other there are documentaries. If the audience is being treated to a bouquet of short films, it is also being introduced the world of music videos that send across serious message on contemporary socio-political issues. The screening of some such music videos struck a chord with the audience on Monday afternoon. The screening began with two music videos from the well-acclaimed Lal Band of Pakistan. It started with the band’s most popular number “Maine usse ye kaha….” which has been penned by none other than the revolutionary poet Habib Jalib from across the border. Jalib is well-known for having openly criticised the establishment right on the face of the political leaders. The second music video from the band shown was the international anthem of the Left which the performers have aptly described as “Azm ka geet…”. This was followed by the screening of a very popular video by KP Sasi “America America…”. The video hits out at the American ‘hegemony’ and its dominance of the international affairs. It accuses the US of being perpetrator of war whether in Afghanistan or Iraq and also holds it responsible for playing dirty politics of oil and energy. The day also saw the screening of the short film “Mere Bina” which deals with the twin issues of suicide and female foeticide in a very sensitive manner. Made by Abhay Kulkarni, the film has Gyan Prakash, an artiste from Nainital playing the lead role. The film sends home the message that resorting to suicide is not a solution to any problem but instead leads to several more problems for a family. Another interesting film screened was “Durga ke Shilpkar” made by another artist from the Lake City Rajeev Kumar who is currently employed with the Films Division of India. A short film that was very well received by the audience was the very popular “An Occurrence at Owl Creek Bridge” by Robert Enrico. The black and white film made in 1962 is considered to be a classic in the genre of short films. This was demonstrated at length by activist Surya Shankar Das in a rich presentation on “Coalition of corporates, government and media in Orissa” during the ongoing film festival titled “Festival of Resistance” in Nainital. Das contended that the space for factual reporting of events has shrunk drastically in the state in the face of the onslaught launched by the corporates in tandem with the police and the administration. With the mainstream media failing to present things in the right perspective while being under pressure from the state and the corporate entities, the tribesmen have now resorted to documenting video evidence of events as they unfold. These videos are then uploaded on sites like youtube.com for the people across the world to see and are also submitted as evidence before various commissions and probe panels are set up to investigate various socio-political issues. He showed several videos shot by the tribesmen that show large-scale atrocities against the tribal population of the state and how their very sources of livelihood are being demolished by corporate entities in the name of development. These videos show how the tribals are fighting for their survival and for retaining their rights over the resources that have traditionally belonged to them. He also demonstrated how even public hearings on issues like pollution and damages being done by release of toxic waste in the rivers are being misrepresented in the mainstream media. “How can one interpret holding of press conferences by the corporates on issues of Orissa abroad where media persons are being given laptops as gifts,” he questioned. Das pointed out that while the new media is helping them prove their point before the world it is also making the tribals more vulnerable to the forces that they are opposing and which are far more powerful than them. He claimed that a large number of videos put up by them are hacked and deleted from different websites. He also stated that those who have been shooting these videos have been threatened and often attacked. Replying to a query by The Tribune, he said while a large section of the tribal people is democratically opposing the attempts to plunder their resources and dislodge them, a small section has even gone over to the Maoists after being disillusioned by the politics of symbolism. She inspire the students to join Anna Hazare’s cadre by raising their voice against corruption. A higher aim in life maintaining integrity and simplicity are what she emphasised to lead a corruption-free life. A large number of students from different schools attended the lecture where Dr Bedi patiently answered to all the questions raised by the inquisitive minds of the younger generation about the Jan Lokpal Bill and its significance in a democratic country. The Mussoorie Gas Sewa is the only agency in Mussoorie that id catering to the needs of a large number of people. It is being run by the Garhwal Mandal Vikas Nigam. Residents, however, alleged that after the booking of a gas cylinder, the agency took almost a month to deliver the same. Sunil, a resident of Kulri Bazar, said despite taking extra charges for home delivery, the agency had failed to deliver cylinders on time. He alleged that sometimes agency officials, instead of providing home delivery, asked us to take the cylinders themselves, causing inconvenience to them. Residents alleged that LPG cylinders were also being sold on the black market. They alleged that this practice was common at a godown situated at Hussain Ganj, where paying additional Rs 100 had become a common practice. However, agency officials refuted the allegations and said the delivery was being done according to the guidelines laid down by the government. On the other hand, consumers are irked over the functioning of the existing agency and are demanding the opening of another agency so that nearby villages that were also dependent on this agency could get some relief. As there was only one gas agency, the gap between the demand and supply had increased. A sales officer (region) of Bharat Petroleum said this decision could only be taken by the Ministry of Petroleum after a survey of the area and considering the demand and supply gap. Till then, consumers would have to cooperate with the existing agency. Mayor Vinod Chamoli said Kesari Chand sacrificed his life at the tender age of 24 in 1945. He said this taught us a lot about great values such as bravery, sacrifice and patriotism. Chairperson of the district panchayat, Dehradun, Madhu Chauhan called upon the youth to take inspiration from Kesari Chand in developing a deep association with the motherland. Others who were present on the occasion included state president of the Samajwadi Party Vinod Barthwal, president of the Khel Parishad Narayan Singh Rana, president of the Kesari Samark Samiti Rajender Singh Tomar, former MLA Munna Singh Chauhan, former vice-president of the Congress Committee Ram Sharan Nautiyal, state vice-president of the BJP Murat Ram Sharma and senior leader of BSP Daulat Kunwar. Delivering the Council of Scientific and Industrial Research Foundation Day lecture at the Indian Institute of Petroleum, Deshmukh said petrol and diesel prices could be reduced if scientists developed innovative technologies for making large quantities of petrol and diesel from one barrel of crude oil. He said this would help the country import less crude oil and save precious foreign exchange. He urged scientists to use their knowledge and resources to develop much-needed technologies. He also asked the IIP to make a significant impact on the efficient use of biomass to make transportation fuels. He congratulated IIP scientists on successfully making 15 litres of jet fuel from Jatropha curcus oil. Earlier, MO Garg, Director, IIP , dwelt on the research being undertaken at the institute. A large number of IIP scientists attended the lecture. In the first match, after winning the toss, UP Cobras put Sports Stadium, Mathura, to bat. Sports Stadium batsmen scored a total of 129 runs in the allotted 20 overs. Amit scored the highest, 32 runs, followed by Akash, who contributed a useful 25 runs. Arvind and Anu took three wickets each for UP Cobras. Chasing the target, UP Cobras were all out with a score of 49 runs, ensuring an 80-run victory for Sports Stadium, Mathura. None of the UP Cobras batsmen except Vishal could reach a double-digit figure. Vishal, too, got just 10 runs for his team. Pradeep of Sports Stadium, Mathura, took 6 wickets in a 3-over spell giving away just 18 runs in the process. In another match, Sher-e-Punjab won by 56 runs against Tamil Nadu. Batting first, Sher-e-Punjab scored 145 runs in the allotted 15 overs. Harpreet contributed a valuable 46 runs to Sher-a-Punjab’s team score. Tamil Nadu could only pile up 89 runs in the allotted 15 overs thereby losing the match?. Himanshu and Rishabh scored five goals each and Santosh netted two goals for the winning team while Amit and Kuldeep, KV-OFD, chipped in with three goals. In the girls’ junior section, Kendriya Vidyalaya-Hathibarkala (number one) edged past SGRR Nehrugram 7-6. Ruchi and Sapna scored 4 and 3 goals, respectively, for the winning team while Khushi and Yamini scored three goals each for SGRR Nehrugram. In the third match in the sub-junior boys’ category, SGRR Nehrugram thrashed Kendriya Vidhyalaya-OFD 16-7. Cantt Blue beat Shivalik 3-2 in the ongoing Shaheed Jaideep Bhandari Memorial Football Tournament held at SGRR, Nehrugram, here today. Tushar (21st minute) and Rahul (44th and 50th) were stars in the win of Cantt Blue. Sushil Rawat (5th) and Sushant (18th) struck one goal each for Shivalik. Taking cognisance of the media reports, the district administration of Uttarkashi on September 13 had issued orders to demolish the part of Pilot Baba’s ashram allegedly coming up on government land. The ashram authorities were also challaned under the PP Act in 2009 for the alleged encroachment. The district court at Uttarkashi, after hearing both sides, granted stay on further construction at the site near the ashram, said SDM of Uttarkashi BS Dhanik. According to the the manager of Santan Dharm Inter-college, which is the coordinator of the meet this year, the schools which have confirmed their participation are Ghanand Inter-college, junior high schools of Kulri and Library Bazar, Sanatan Dharm Inter-college for Girls, Ramadevi Inter-college, St Lawrence High School and Mussoorie Inter-college for Girls. The chief guest will be Mussoorie MLA Jot Singh Gunsola while Rajpur MLA Ganesh Joshi and Municipal Council President OP Uniyal will also be gracing the occasion. The meet is organised especially for the students of the partially or completely funded government schools of the region.